Available on Kindle, Nook and CBD Reader! 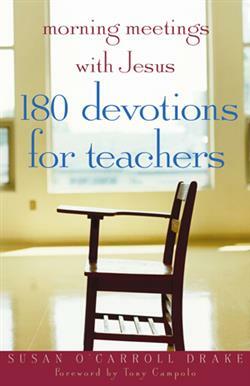 Designed for each school day in the student year, these light-hearted and insightful devotions offer lessons from the Master Teacher and a challenge to apply these lessons in real-life situations that confront educators in today's classrooms. • A devotion for each day of the student school year, complete with vignette, recommended scripture, focus on a specific aspect of Jesus' teaching model, application of the scripture lesson, and a suggested prayer with challenge/focus. Makes the perfect gift for the Christian teacher in your life! Susan O'Carroll Drake is a former public school teacher who currently works to support her children's teachers as a classroom volunteer and executive board member of the Parent Teacher Association. Drake holds an MS in Biology and Human Nutrition, a BS in Psychology, and a secondary science teaching certificate. During her year in the classroom, she received numerous teaching honors, including being named Colorado's Outstanding Biology Teacher.